What quest is it for? What quest is this for? I just got one on Bertoxx, and nobody will give me a PC =( You guys know what the quest is called? 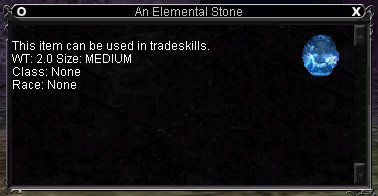 actual name "An Elemental Stone"
Drop frequency you ask? Oh yes, it's in fact very rare... perhaps even moreso that indicated by Tolkien. I'm used to seeing one drop about every 15-20 hours of grouping in decent PoE groups. price ~30-50k depending on how much the blood costs. I've got everything else I need for the rings apart from these - haven't even seen them for sale in the bazaar on Quellious. Anyone have any idea how rare these are, and roughly how much they sell for?